Nice clean small park. rock/gravel sites. open. large/long pull thru's for big rv.s owner lives on property, very nice, friendly. convenient, 1 block off hwy. We camped at Picketts RV Park (formerly Alamo RV Park) in a Motorhome. Manager greeted us as soon as we pulled in. Very friendly and helpful. Even though the park was not in our new Passport America Book, they gave us the Passport rate. New owner/management. Cable TV is coming. Restrooms and showers are in the works. Level sites all gravel. Next door to the grocery store in town. 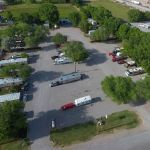 We camped at Picketts RV Park (formerly Alamo RV Park) in a Fifth Wheel. I stopped by another RV park that didn't have any sewer hook-ups and they advised me of this place. What a wonderful stay with pleasant people and grassy areas and a steam that run through the East side of the park. I would recommend any one to stay here. We camped at Picketts RV Park (formerly Alamo RV Park) in a Motorhome.